As part of its new food preparation range, Tefal has released the new Vitacompact Food Processor, which boasts 1000W of power. Compact, sleek and stylish and designed to create domestic bliss in the kitchen by making food preparation a breeze. This ultimate kitchen gadget can slice and grate, blend and knead, chop and whisk – not to mention the nifty citrus press – perfect for the budding chef. The high level of power (1000w) means that the Vitacompact is great for kneading heavy dough, slicing vegetables and chopping meat for burgers. What makes the Tefal Vitacompact unique is its handy storage drawer, positioned on the front to store some of the food processors attachments, putting an end to misplaced accessories and ideal for keeping a tidy kitchen. The Vitacompact looks stylish on any work surface, compact yet with a large 3L capacity bowl and 1.5L capacity blender. The two speeds and pulse setting means mixing can be controlled more easily so budding chefs can achieve the desired texture every time. For those wanting to bake their own bread and pastry the kneading blade on the Vitacompact stretches and manipulates the dough to give excellent results. The dual sided stainless steel discs make fine slicing, grating and emulsifying quick and easy, while the mini-chopper and whisk give great results every time. You lost it or someone stole it? like in "Enemy of the State"
Was £47.00 in the black friday sale, and was (and still is) £89.99 at currys at the time, so this is still an excellent price and gets good reviews. Very neat system. ideal for the job and as already posted, a good sized motor! 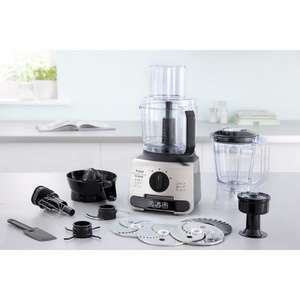 Typical Sony charging over 50 quid for a food processor attachment. I get bored of reading stupid reviews from people - if you listened to half of these idiots, you'd never buy anything. Most people complaining because the bloody box it comes in is too big!! And the rest complaining that it comes with too many attachments to store! Ordered thank you. I get bored of reading stupid reviews from people - if … Ordered thank you. I get bored of reading stupid reviews from people - if you listened to half of these idiots, you'd never buy anything. Most people complaining because the bloody box it comes in is too big!! And the rest complaining that it comes with too many attachments to store! Got this on the lightning deal ever so slightly cheaper and its fantastic for the money. can anyone tell me how to get the mini chopper working?